Derived from Urea, Phosphoric Acid, Potassium Hydroxide, Aqua Ammonia, EDTA Copper, EDTA Iron, EDTA Manganese, Sodium Molybdate, EDTA Zinc, and Leonardite Ore. 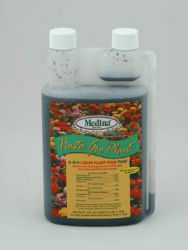 SOIL APPLICATION: For flower beds and flower pots, mix 1 oz. per gallon of water and apply with a sprinkling can. Thoroughly water the soil around the plant. Repeat every 3-4 weeks during growing season. TRANSPLANTING: To increase root growth and reduce transplant shock, new plants can be watered in with a mixture of diluted HastaGro. Mix 1 ounce per gallon of water and pour slowly to wet all of the loose soil around new plant. FOLIAR APPLICATION: Use a hose on sprayer. If the sprayer has an adjustment, set for 1 tablespoon or 1/2 ounce per gallon. Fill the container with undiluted HastaGro. Spray until leaves start to drip. Best time of day is mornings or evenings when it’s not hot. Do not wash the spray off the foliage. One quart should cover 10,000 square feet. You can repeat every 2 weeks during growing season. With a pump-up sprayer, mix 1/2 ounce with 1 gallon of water; spray as above.